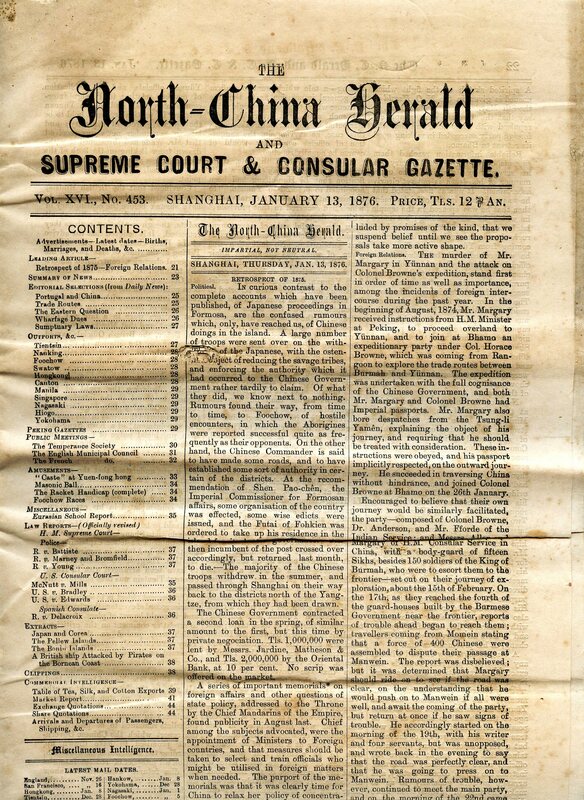 I have been making use of Shanghai’s North China Herald newspaper (1850-1941) for over years, mainly in the shape of the steadily crumbling copies in the library of the School of Oriental and African Studies. Recently I have been working with the Leiden publisher Brill, who have had this set of the paper scanned, and are preparing a full-text searchable edition. Pester your library for it. The Herald (北華捷報) predated the North China Daily News 字林西報by 14 years, but thereafter became the weekly edition of that daily, the biggest selling English-language newspaper in China. It was edited by, amongst others, R. W. “Bob” Little, brother of the more famous Archibald John Little, who pioneered steam navigation of the Upper Yangzi river. The Little family letters were an important source in my book The Scramble for China. All human life is here in the Herald, and death too. There are court cases and gossip; lists of ships’ passengers and the racing results: polemical editorials and verse; news of ‘outrages’ and ‘outport’ parties; cartoons and inquests, and more.